According to the firemen, the cause would have been a short circuit in an air conditioner, although the suspicion will only be confirmed once the investigation is concluded. The experts of the Medical Legal Institute of Rio de Janeiro have managed to identify this Sunday the remains of the two deceased in the fire in a Flamengo lodge whose identity was still unknown. The club itself reported that the remains are of Jorge Eduardo dos Santos Pereira Dias and Samuel Thomas de Souza Rosa, who could only be differentiated by specialists through forensic examinations in which the size of their bony structures was compared. The identification of the deceased, who were transferred to the Medical Legal Institute on Friday, shortly after the fire in which ten players died from the club's quarry, was hampered by the high degree of carbonization of the remains, which burned at a very high temperature. All the deceased were between 14 and 16 years old and played in the lower divisions of Flamengo, the most popular club in Brazil. The disaster also left three wounded who remain hospitalized. One of them, Jhonatan Cruz Ventura, 15, continued on Sunday in serious condition, while the other two could be discharged in the coming days, according to the doctors who treat them . The fire broke out at dawn last Friday in one of the lodgings of Ninho do Urubu, a modern training center that the club owns in Rio de Janeiro. According to the firemen, the cause would have been a short circuit in an air conditioner, although the suspicion will only be confirmed once the investigation is concluded. Flamengo reported on the identification of these two victims a few hours after the remains of Christian Esmerio, a promising doorman who died in the fire, were buried. 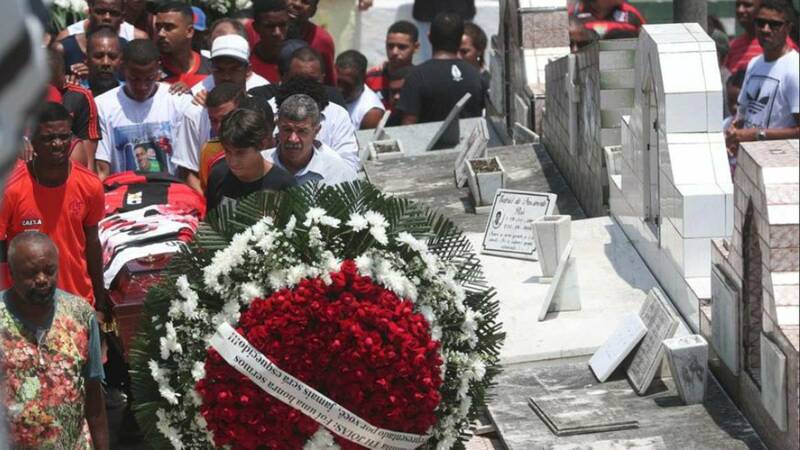 Esmerio was 15 years old, had already been summoned for the youth teams of Brazil and his funeral was attended by hundreds of people, many wrapped in the flags of Flamengo, whose anthem was sung when the coffin was deposited in the cemetery of Irajá, an impoverished neighborhood of the northern area of Rio de Janeiro.